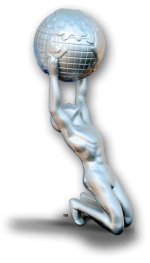 "47th NAACP Image Award Nominee in Literature"
The Audacious Woman: Blaze Your Own Path To Prosperity, by Pamela Y. Toussaint, MBA (Courageous Women Publications, 2015, 118 pages). 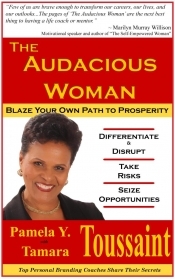 July 8, 2015 (San Diego’s East County) - Pamela Y. Toussaint, MBA, the president and founder of Ultimate Image Coach, has authored with her daughter, Tamara Toussaint, JD, the quintessential book on women’s empowerment; The Audacious Woman: Blaze Your Own Path To Prosperity. A personal branding consultant, corporate trainer, author, and keynote speaker, Toussaint came from humble beginnings to write this well researched and documented book. Born and raised in a small village in Jamaica with three sisters and brother, her mother was widowed when Pamela was 10 years old. Against all odds, motivated by the values her mother instilled, Toussaint achieved success as a corporate executive and community leader in the United States. She took an audacious step to re-write her life’s story, and re-branded herself as The Ultimate Image Coach. Click to view.